Without our wonderful customers and smiling faces everywhere we go, we would not be as dedicated to providing these fermented foods. The people who come out week after week to support us and other local farms and businesses inspire us. Without you all, local would not be possible. The first time I tasted kimchi, the spicy, tangy, intensely flavorful crunch of fermented cabbage and seasonings, I fell in love. The Korean staple dish stole my heart, but more importantly, it fed the trillions of bacteria living in my gut, known as the microbiome. I didn’t know then that ingesting fermented foods could support health in more ways than could be counted. There are trillions of bacteria living in the gut and they influence nearly that many bodily processes. Yum. Now that Richmond-made kimchi is available, I am delighted. 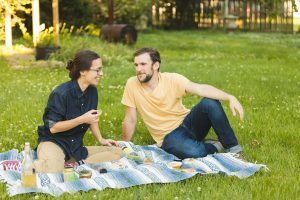 That’s because life and business partners, Grant Collier and Bri McCarthy, took their love for fermented foods to a whole, higher level. 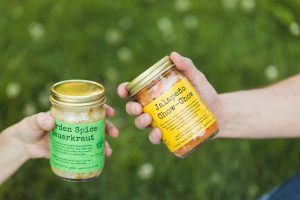 They created Wild Earth Fermentation to help support local farmers and promote locally grown foods, all while sharing an extremely healthy and tasty selection of fermented foods with friends, family and the rest of us. Wild Earth Fermentation brought together their interest in local, sustainable food systems and the health benefits of fermented foods. Their slow growth business model is an homage to the sowing and harvesting seasons, by necessity. As the business grew, the duo turned to THRIVE for business mentoring. “Like most new businesses, I heard about the THRIVE network through other local entrepreneurs. I was referred to Rebecca Thomas and she has been a huge help getting our numbers together and focusing on what is most important to us,” Grant says. Rebecca worked with them on the specifics of developing a direct to consumer or wholesale operation including determining the true costs, including labor, invested in the product. They also worked with a second mentor, Leslie Madden, who helped with accounting processes. with plans to be featured on more menus and in new locations in 2018. 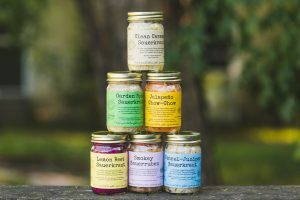 This year, they are excited to introduce fermented pickles in this summer, a new product in high demand.